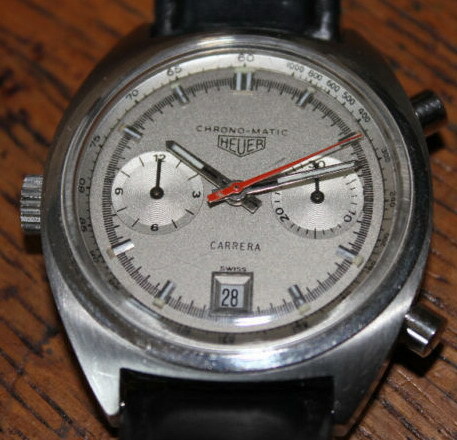 Shown below is an eBay listing for a Chronomatic Carrera, that should teach all of us a lesson. The Chronomatics are among the rarest of the vintage Heuers, with no more than 20 samples known within the community of collectors. Of these, the Chronomatic Carreras are especially rare, with only three or four having been spotted over the past decade. The lessons here: If you are dealing with a rare or collectible watch, use an experienced watchmaker / jeweler, who understands the nature of the watch. Even with an experienced watchmaker who understands the watch, be careful in communicating what you would like to have done to the watch and what should be left alone. Different collectors have different preferences, so be sure to make your preferences known. Ask the watchmaker to call you if he sees anything unexpected or recommends doing anything that you had not mentioned. In this instance, a well-intentioned jeweler destroyed a rare and valuable watch, and “all the kings horses and all the kings men” won’t be able to put this one back together again. This is one of just a handful known to exist. First let me tell you the story behind this Carrera. Up until about a year and a half ago this watch still had it’s original blue dial face with all of the proper printing with a little patina. I took it to a local jeweler who normally had very good watchmakers working for them. The watch was in perfect running order and only needed a pusher replaced. I also took my Autavia in at the same time that I had dropped on the floor and it needed quite a bit of repair. After 3 months or so I received a call that my watches were ready to be picked up. I went to pick them up and they had and replaced the pusher with a non-matching one and they had flaked off quite a bit of the original 50-200 “tachy” ring. The ring was also off center by 20 minutes! I was upset about this and took it back to the jeweler to see it they would have matching pushers installed and maybe repair the tach ring. The jeweler wanted to make things right and said they would have them refinish the tach ring and since the dial face was showing some wear they would have it refinished as well, no charge. That sounded good to me because I really liked this watch and I wanted it to look nice and correct again. Well, that was my big mistake. after another three months or so I got it back looking like it does in the pictures with the wrong face color, wrong dial printing (Chronomatic shouldn’t have a hyphen and the Carrera script isn’t quite right not the mention the tach ring isn’t the correct graduation 60-1000! Needless to say I wasn’t happy at all, especially after I had done a little research on the web and realized just how rare this watch really is. The last one that sold was at auction a few months ago went for over $11,000. It was a nos perfect example. My jeweler has offered to pay for repairs to make the watch back like it was for me if I can find the proper dial face and “tachy” ring. I just don’t have the connections or the time to find the correct pieces. 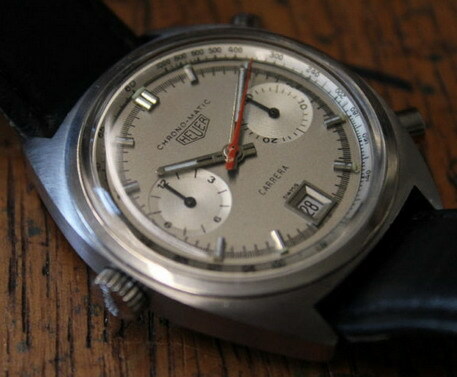 So I have decided rather than be mad every time I look at this rare timepiece I should just sell it. The watch currently has a Calibre 12 movement. The original Calibre 11 must have been replaced with the updated Cal. 12 at some point before I bought the watch in the mid-nineties. It has a non-original band. The case is marked 1153 for the model and the serial number is on the opposite side and very hard to make out (pictured) 147xxx. After emailing with Jeff Stein at “On The Dash” he confirmed that this watch in the proper serial number range for the Chronomatics.